Is the DBS Woman’s World card no longer awarding 10X points on GrabPay topups? 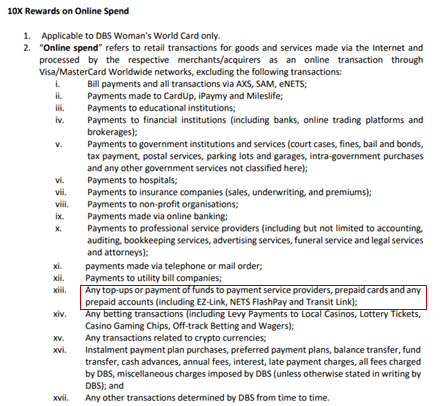 36 Comments on Is the DBS Woman’s World card no longer awarding 10X points on GrabPay topups? Top up transactions made on or after 24 December appear to no longer earn 10X points. Alternatives still available, however. Chalk this up as unconfirmed, but it seems very likely that GrabPay topups no longer receive 10X points (4 mpd) with the DBS Woman’s World Mastercard. This matches my personal experience for the month of December. 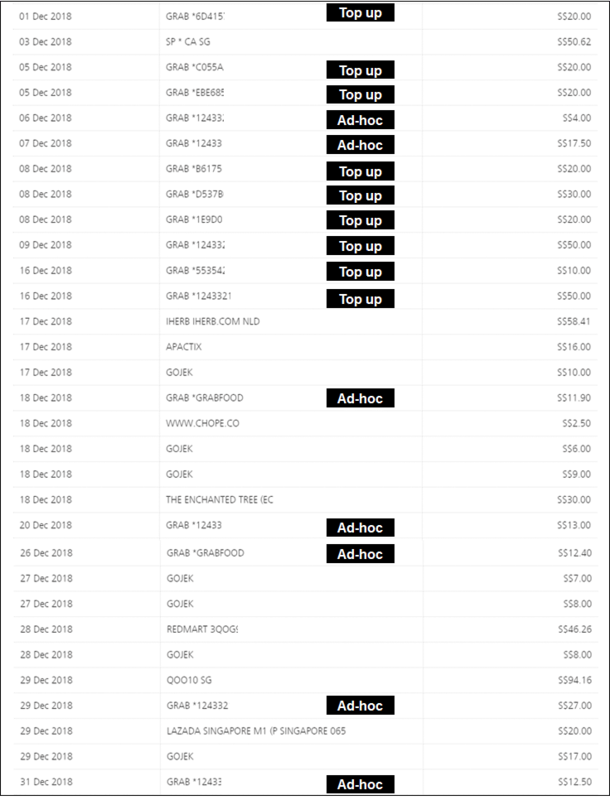 The DBS CSO told me that all my Grab transactions had earned 10X, but it just so happened that my top ups were done before 24 December. You could argue that this isn’t a new exclusion by DBS per se, just the enforcement of an existing one. The September 2018 version of the WWMC’s T&Cs excludes top ups to prepaid accounts, which one would assume GrabPay falls under. Still, it’s going to sting for those who have been faithfully using their WWMC for GrabPay topups from 24 December (me included). These transactions will earn you only the 1X base points, or 0.4 mpd. What cards continue to earn 10X on GrabPay topups? Fortunately, there are other ways to continue earning bonus points on GrabPay topups. Both the Citibank Rewards Visa and Citibank Rewards Mastercard still earn 10X points on GrabPay topups, subject to the usual $1,000 cap per month. 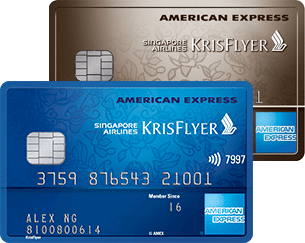 If you don’t have one of these cards yet, you can get up to $200 of Grab/NTUC/Taka vouchers or $150 of cash by applying through the SingSaver January sign up offers. You can also win $888 of cash by taking part in the ongoing Air Miles vs Cashback competition- more details about that here. The increasing adoption of GrabPay means that it’s a potential route to 10X everywhere– top up your balance with a 10X earning card, and use your credits at merchants which would normally only attract regular general spending rates. DBS’s move will put a dent in some people’s strategies, but it’s worth noting that there are (for the moment) other ways to skin a cat. Do CIMB Visa Signature and Citi CashBack card earn 10% /8% CashBack (worth more than 4mpd) for Grab top up? All cashback cards are capped. Miles cards aren’t. Not true. You’ll don’t even have to go far to find counter examples – all of the miles cards featured in this article have caps. How to have an adhoc Grabfood transaction? I usually have to topup the grab wallet and then pay grabfood using GrabPay.. this would have been topup, not adhoc like taking a grab ride right? Just have to change the default payment mode in your grab app to something other grab wallet. If the giving of bonus points for the WWMC is dependent on the merchant (Grabpay wallet) MCC at time of transaction, can “we” (led by milelion) collectively “ask” the merchant to change the MCC similar to adhoc payments when we topup grabpay wallets? When did you try crv? 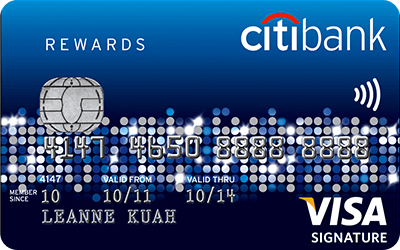 Any idea why would Citi Rewards MC/Visa reward 10x for grab top ups? It doesn’t involve fashion/department stores. Not that it’s not a good thing, just wondering why there’s this loophole. Wow i’m equally intrigued. I never knew about this and how does it exactly link up since its not in the respective categories. Data point: Still getting 10x on CRV for 18 Jan transaction, posted today. Interesting to get more data points, I tried both citi rewards visa and MC for topping-up grabpay and it gave me 10X for visa and no points for MC. Any way to get 10X with the MC too? Same for me, I’ve stopped receiving rewards points beginning late Dec 18. I’ve called the CSO to clarify and it appears that they now differentiate between grabpay topup and adhoc payments. 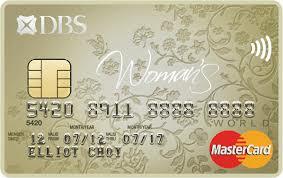 Hi Sir, may i ask how can figure out the detailed list of the points earned by DBS woman world card by transactions? By my knowledge there is only points summary can be seen via app and website. Thanks. how about payment to fave? does it count as ad hoc? Thanks Aaron for the article. It’s very useful as i did various type of topups to the DBS WWMC and BOC EM monthly. 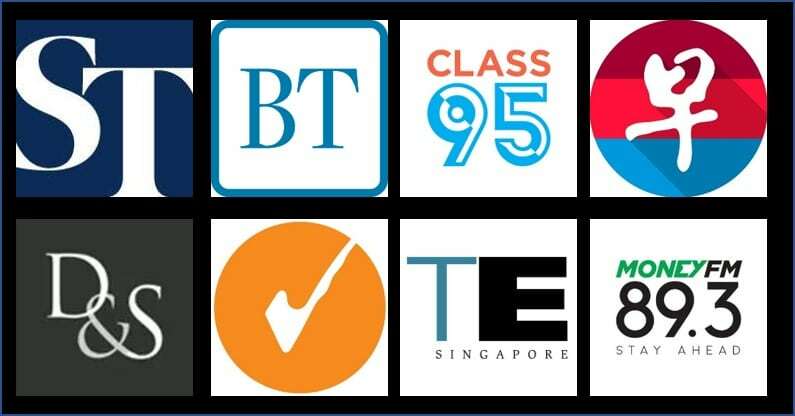 I have one question as to will DBS adjust or clawback those points earned from Sep to Dec 2018. This is because BOC has adjusted my reward points downwards from similar topups (adjustments from Oct 2018 to Jan 2019). Any advice which i can get back those points? Thank you! Hi Aaron, I have emailed BOC previously and confirmed that BOC allows youtrip as a transaction to get the points. May I know what is this clawback referring to? I spoke to the CSO this morning and they are adjusting points downwards for certain type of topups i.e. Dash, Youtrip etc., whereby no points should be awarded per their TnCs. Not too sure how many cardholders are affected at the moment but just be aware of how they are handling the clawback issues. Can you share the email screenshot where BOC said its eligible? Just spoke to a DBS CSO, she confirmed that GrabPay topups still constitute an online transaction and will post for 10x. Just spoke with DBS CSO, grabpay top ups are not eligible for 10x points, normal transactions for rides via card payment still qualify though. Received written reply from DBS. Top up GrabPay not eligible for 10x DBS. Previous Entry Marriott Rewards to be rebranded as Marriott Bonvoy – what’s changing?